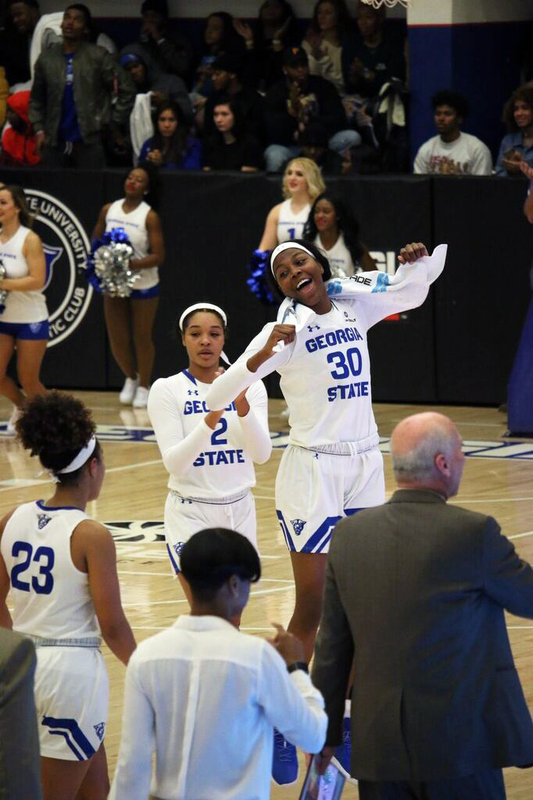 Georgia State women’s basketball will head into the Sun Belt Conference tournament on a loss after dropping a tough one to the South Alabama Jaguars, 70-69. The Panthers had a solid start to the game. Sophomore forward Shaq Miller-McCray made her presence felt as she scored the first two baskets for the Panthers and had a block. The first quarter was back-and-forth, and the Panthers trailed 18-15. The start of the second quarter was a lot different, as the Jaguars started jumped out to a 29-15 lead, due to an 11-0 run. The run was aided in large part to freshman Antoinette Lewis scoring the first eight points. The Panthers didn’t score their first points of the quarter until under six minutes to go. Georgia State responded with an 8-0 run, capped off by a steal and score by point guard Madison Newby. Newby and Miller-McCray carried the Panthers in the first half scoring 11 and nine points respectively and the Panthers went into the locker room trailing 37-28. Things were looking the same for the Panthers. South Alabama was still getting open looks and nailing three pointers, but just about halfway through the third quarter, Janessa Murphy and Kierra Henry both came alive. Murphy and Henry scored 25 points apiece in the team’s win over Troy this past Thursday. The two combined to score four points in the first half but changed their fortunes around scoring 21 collectively in the third quarter. The Panthers trimmed the lead to five at the end of three trailing 56-51. The fourth quarter was back-and-forth as the teams seemed to trade baskets. When the Panthers would trim the lead, South Alabama sharpshooter, Savannah Jones would nail a three-pointer. “I think we were getting lost a little bit and we weren’t communicating as well,” Baldwin said. Georgia State would take the lead by one on a Janessa Murphy jumper, but once again, Jones responded with a three. The final two minutes of the game were the most exciting: Henry made a jumper to give the Panthers a 69-68 lead. South Alabama would retake the lead on a Chyna Ellis layup on a scramble with 1:15 remaining in the game. The defense held on both ends, and the Panthers would force a shot clock violation with 19.5 seconds remaining. Henry had the ball with a chance to make the game-winning basket, but Antoinette Lewis blocked her shot as time expired, and the Jaguars would steal a 70-69 victory in the Sports Arena. Henry finished the game with 21 points, and Miller-McCray finished with a double-double of 14 points and 10 rebounds. “I just want to play to win really, I don’t worry about stats,” Miller-McCray said. The Panthers finished the regular season with a record of 8-21 and a 4-14 record in Sun Belt Conference play. They will now head to New Orleans to play in the conference tournament, as the No. 10 seed.